kiev wrote: Let me know what is highest priority and i'll focus on that aspect of tracing. You probably mean people that are actively attempting to repair their charger, like Skylogger, but my thought is to start with the power supply for the charger board. That would be the corner with the yellow-taped transformer (or multi-winding inductor) on its own. The pair of transformers with "GD" in the part number are probably Gate Drivers. After that, I think perhaps the PFC circuit. It would be nice to know if there is an enable signal for that, which is preventing the PFC stage from boosting Skylogger's mains beyond peak mains voltage. i noticed some blistering in Jay's unit in the AC input doghouse potting at the end of the coil toward the side of the box--i will go ahead and dig all of that mess out just to see if there are other components (not likely) and if the end of the coil is damaged or heat-affected. Then i'll get after the low-voltage power supply and PFC traces. Having trouble finding data sheets on some of the devices related to the low-voltage power supply. 1. photocoupler used 7 times across the slot cut in the board to isolate the CN1 connector. It is a 4-pin SMD opto device with a Toshiba logo but the part number, 9121, seems to be not a standard part. 3. Three Diodes marked, 2U 1D. 4. IC702, an 8-pin smd from JRC, Japan Radio Corp, but part number partially etched, 2x69x T008H JRC. Last edited by kiev on Sun Aug 05, 2018 4:01 pm, edited 2 times in total. There is a DC supply voltage coming from the Top Board across the CN1 connector on pins 5-8, with ground on 1-4 and 47-50. This is filtered by an electrolytic cap, C841, 15uF 35V, and is then chopped thru a transistor TR310, an N-FET 2SK3484 100V 16A, to excite the primary on pins 8-9 of the CV transformer, T302. The gate is driven by a 10W flyback switching regulator chip, IC702 JRC 2369Z. There is a First secondary on T302 pins 6-7 that is half-waved thru diode D334, 2U 1D, that ties back to the CN1 supply ground and regulated by IC317, M050 5V regulator. This 5vdc is used for the supply voltage on two isolation amplifiers, PC312, 313, Broadcom A 7827. PC313 is sending the output current sensed thru R232, 0.008 Ohms, across the isolation slot to an op amp, and then on to the CN1 connector back to the top board. PC312 is sensing the  HV output voltage and sending it back up to the top board on CN1, pin 42. So the box is smart enough to measure itself and likely won't come on if something doesn't feed back properly to the top board. And there is a Third secondary winding on pins 2-4 is half-waved thru D331, filtered by C 845 15uF 35V, that provides ~ 16.6 vdc supply voltage for the PFC chip, IC312 UC2854 and to the solder pad pin “13”, which is the positive rail of the push-pull gate driver for the 3 PFC gates. 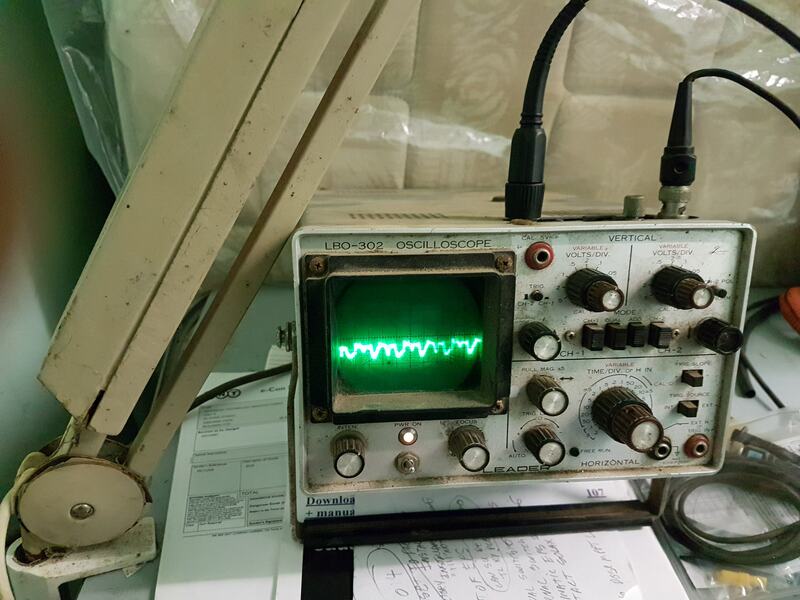 There appears to be an adjustable shunt regulator at IC318, marked TACQ, TI TL431-Q1, that provides a feedback signal back to the flyback regulator chip, IC702, that is pulsing the transformer. The 16.6 was my calculated value based upon the resistor network for the shunt regulator. The ground reference for the 2nd and 3rd secondaries is to solder pad “11”. So if possible check the top board to see if it is generating the initial DC voltage from which the low-voltage supplies on the bottom board are created. i don’t have that board in front of me right now, but it would be a somewhat easy fix if the issue were the low-voltage supply on the top board—without that supply the bottom board would not function. The 5V drive for the AC Input Relay coil comes down from the top board on CN1 pin 26 and the return is pin 25. If this were defective then the relay couldn't come on. You might look for one of those M050 5vdc regulator chips in the vicinity as a source for the coil voltage. Last edited by kiev on Thu Aug 09, 2018 7:56 pm, edited 1 time in total. It's amazing your tracing across the fine pitch 50 way connector. I've run a few test so far, at a snails pace, disconnecting the top board, standing it up vertically so i could solder wires to the pins on the two white strips, that run to a block of screw terminals, then put it all back together, connect AC, and do measurements across the terminals. It's a bit of a worry trying to lift the top board up and down over and over without damaging the flex strip. I just got through soldering some wires to pin 3 and the Tab on Transistor T310, and after supplying AC, I've found this first rail to be dead. In your previous message, you say what the voltages should be for all the supplies that get created from this first rail, but I did not see where you mentioned what this first rail voltage actually should be. 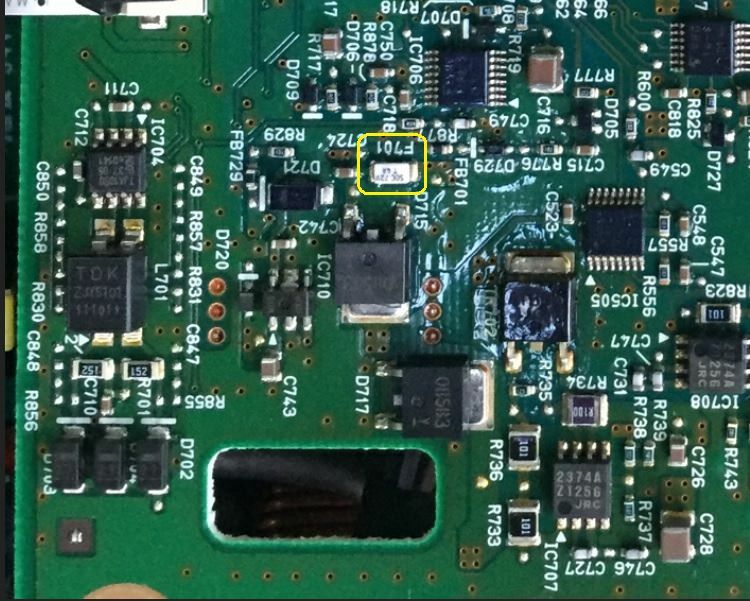 The communication cable that connects to the TOP PCB, Via connector E-02 on the maintenance manual schematics, has a PIN 7 RED wire that connects back to the 12v battery. There is also a PIN 2 VIOLET wire that connects to 12v via the contacts of the On board charger relay. These both reference to PIN 10 Ground on this E-02 Connector. I am thinking that the main rail coming across the flex cable will probably be dead until 12v is supplied to pins 2 and 7 and ground connected to pin 10 of E-02. There is also a PIN 12 Beige colour wire on this connector that is a signal called CHGP from the EV-ECU, That may have to be at a particular voltage to enable the charger. It looks to me like the power is coming through the comms connector. The mains conditioning seems to be for the two terminals that go to the charger board. So that would be a provisional "probably no". Nearly half of the top of the top board seems to be devoted to a power supply; there are a lot of inductors, electrolytic capacitors, and power semiconductors underneath. I see at least two capacitors with the "V" voltage code (220V and 330V). These are too small to be 220 volts and certainly not 330 volts. From https://forum.digikey.com/t/smt-electro ... rating/974 . A 35 V rating suggests 24 V nominal design voltage. The next lowest code is E for 25 V, too close for comfort. The battery voltage, nominally 12 V, is a little low for sending over thin wires, and besides it varies from 11 to 14.4 V depending on the state of charge of the battery, and the loads. I am thinking that the main rail coming across the flex cable will probably be dead until 12v is supplied to pins 2 and 7 and ground connected to pin 10 of E-02. Difficult to tell, but not even 4 V peak to peak is certainly too low. Will post photo later, but it would be easy to check--hopefully that fuse is blown and it will be an easy repair. Last edited by kiev on Tue Aug 07, 2018 4:27 am, edited 2 times in total. I can save you the trouble. Well spotted! Now to figure out its specifications. Something like 2410 imperial [ edit: was 1608 ], 72 V, wild guessing about half to one amp? Soldering in a 20x5 1 A fuse could make for a very temporary fix. Or perhaps soldering in a 20x5 fuse holder; soldering fuses often seems to ruin them. Insulate well, of course. Last edited by coulomb on Mon Aug 06, 2018 8:14 pm, edited 1 time in total. That's the one--it is marked SOC 72V T 4A on my board. i hope the fuse did it's job and blew due to inrush current into C702 and C701, the big cans on the top side of the top board. i didn't think to ring out the control cable from the exterior 13-terminal E-03 connector, to the interior CN101 12-terminal connector, [pin 12] is the one that supplies the bottom board--if that fuse is blown then the charger won't work. Looking at the charger control wiring diagram, there are 2 12V feeds into the OBC, one may be always connected thru a fusible link E-03p7, and the other E-03p2 is switched thru a relay controlled by the EV-ECU. Last edited by kiev on Tue Aug 07, 2018 4:26 am, edited 3 times in total. I don't see any CAN connections to the charger. It seems to only have the CHGP input, the pilot signal (pin 3 of the J1772 charge port), and the switched 12 V input. It looks like the EVCU just says yes or no to "charge as much as the pilot signal tells you, till the battery is full". Maybe the CHGP is for charge partial, and go/no-go is all via the 12 V charger relay. There may still be charger enable CAN messages, but handled by the EVCU, which result in changing the EVCU's outputs CHGB and CHGP. That might mean that if these chargers prove to be hopeless to repair (I don't think so, but they might turn out that way), then replacement with a more generic charger may be possible.